There are some many variations on the game of poker these days, especially if you include all the video poker offerings and the popularity of Texas Hold’Em and Pai Gow Poker. 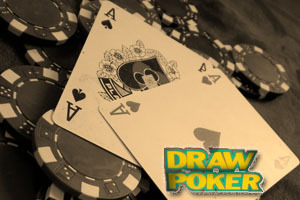 With all those options, Five-Card Draw poker – considered by many to be the original game – has been somewhat forgotten. Well, it’s time you got acquainted with an old friend. With just two rounds of betting in Five-Card Draw and the fact that strong hands hold up much more than they do in Hold’Em – where weak hands can suddenly become winners – the game goes by much faster. That appeals to some players looking for quicker action but for those novice players, it can mean a rapidly-diminishing chip stack. Pace yourself and have a strategy when it comes to bet size. If you’re sitting with a strong hand and you’ve open bet, for example a pair of Kings, make sure you know just how many cards the guys across from you are taking. A draw of three could mean they have a pair – unlikely better than your Kings – or they could be desperately chasing a flush or straight. If they only draw one or two new cards, that pair of Kings could be leading you down a dark hole. Chances are they’re either holding three of a kind or two pair and looking to pad that hand or they are going for a straight or flush. Folding before things get worse is much smarter than bringing a knife to a gun fight. Unlike Hold’Em, a pair may not be enough to win a pot, especially if it’s a short pair – pairs smaller than Jacks. Five-Card Draw players should be very careful when betting on short pairs and may not want to open bet if you’re holding shorts. Wait and see how the other players open wagering and approach with caution. If you have a pair of Jacks or better, you have a bigger window for betting but you should save the bigger bets or calls for pairs of Kings or Aces.